Intro: The fruit has been grown in Far North Queensland for a long time, however, the fruit of this variety tends to be small and sour. The new selections are generally larger and more flavoursome. 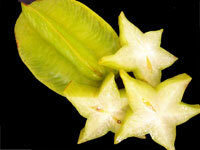 The carambola has been cultivated in Asia since ancient times. Carambolas (Fwang Tung) are a good substitute for apples in recipes. History: Native to Indonesia and the Moluccas. Shape: The fruit is oval. It consists of five prominent ribs (sometimes four or six), which run its entire length. Weight/size: The carambola is typically 5cm to 12cms long, between 2.5cm and 6cms in diameter, and weighs from 115g to 385g. Colour: The thin, waxy skin of carambolas is either a translucent pale yellow or green. Two to 12 flat seeds are lodged inside the ribs. Taste: Very crisp, juicy and refreshing. Yellow fruit tend to be sweet and green ones more acid. Buying/storage: Choose fruit that is firm and undamaged. It will keep in the refrigerator, covered, for up to two weeks. Preparing/serving: The fruit is generally eaten fresh. If the carambola ribs show brown lines, remove before slicing to give a sweeter taste. Slicing crosswise produces star shaped slices that are great for decoration. It is also a good fruit for salads, juicing, ice tea, tropical drinks, chutneys or on skewers with shrimp or chicken. The green fruit can be used as a vegetable and for pickling. Immature fruit can be used as a souring agent in curries.